• Rod and Treat: A sub slab injection will allow a barrier to be placed between the foundation of your home and the soil beneath your home offering great protection against active termites. • Drill and Treat: A liquid application will be made into wood to quickly eliminate any active termite infestations. • In-wall Foam Injection: This allows a complete treatment of the interior walls of your home, without having to leave home. You don’t have to bag up your food, remove your plants, and cause unnecessary disruptions to your everyday life. • Fumigations: A tent will be placed over your home for three days giving you the peace of mind to know that all active infestations wherever they may be have been eradicated. 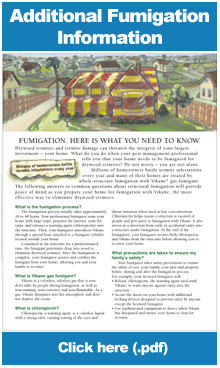 Click here for additional fumigation information (.pdf). • Full Subterranean Termite Treatment: Pressure treat your slab, foaming, trench and treat, rod and treat, etc. When it comes to protecting your home from subterranean termites we have the solutions you need. Termite monitoring stations will be placed in strategic locations around your home to monitor any active termite infestations. We will inspect and monitor them on a regular basis. If active infestations are found the monitoring sticks will be replaced with a bait that will allow the termites to ingest and carry back to the colonies giving your home the protection it needs and keeping active infestations under control.